Electricians install wiring, fuses, and other electrical components in homes, businesses, and factories, and they also maintain that equipment. Many electricians install and maintain voice, data, and video wiring in addition to working with high-voltage wiring. An electrician can specialize in either maintenance or construction, but many work in both areas. This occupation employed almost 667,000 people in 2016. This is a diversified job depending upon employer and specialty, but some responsibilities are common. Diagnose electrical problems by studying diagrams, manuals, and specifications. Troubleshoot systems and conducting tests. Repair electrical problems by replacing faulty parts and components. Plan layout and installation of electrical wiring, equipment, and fixtures. Install feeder and branch conduit and wiring. Comply with all safety standards and regulations. Electricians who work for the government tend to be the most highly compensated, but median annual salary across all sectors is about $54,000. This job doesn't require a college education, but it does require schooling and licensing. Electricians must be at least 18 years old. Education: You'll need a high school diploma or a GED. Apprenticeship: Electrician apprenticeship programs generally last four years and include 144 hours of classroom instruction and 2000 hours of on-the-job training each year. Licensure: Most states and municipalities require that electricians be licensed. You'll have to pass an exam that tests knowledge of electrical theory, the National Electrical Code, and local electrical and building codes. Electricians are a highly unionized profession. In fact, the percentage of workers who belong to a union is higher than that of workers in any other industry. This profession requires multiple skills, traits, and abilities. Manual dexterity: An electrician must have good manual dexterity and eye-hand coordination. Physical fitness and a good sense of balance are also required. You might be required to routinely lift heavy objects. Good color vision: An electrician must be able to identify wires by color, so good color vision is necessary. Troubleshooting skills: You'll need the perception to figure out the cause of problems and the best way to fix them. Critical thinking skills will also help because they let you evaluate the pros and cons of possible solutions. 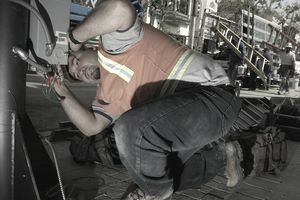 Ability to work with a team: Many electricians work in crews with limited supervision. The job outlook for this occupation is good. According to the U.S. Bureau of Labor Statistics, it will grow at about 9%, as fast as the average for all occupations, between 2016 and 2026. Experienced electricians also have many opportunities for advancement, with or without changing employers. They can become supervisors. An electrician who works in construction can become a project manager. An electrician can also become an electrical inspector for a municipality. Electricians might work indoors in residential and commercial buildings, or outdoors on construction sites. This can sometimes mean working in inclement weather. Working in this occupation can be uncomfortable and, at times, dangerous. Electricians work in cramped spaces and they spend a lot of time standing or kneeling. They are subject to minor injuries such as burns, shocks, and falls. Wearing protective clothing and equipment at all times is important. Electricians typically work full time and may work overtime hours as necessary. They sometimes have to work evenings and weekends. Self-employed electricians might work longer hours in the interest of maintaining and growing their businesses. Although it might not be required, these schools offer a range of programs from basic information about the field to safety management. Graduates can receive credit toward an apprenticeship program. Enroll in a program that combines classroom instruction with on-the-job training under the supervision of experienced electricians. Some unions sponsor such programs. Similar jobs can require more or less education and varying licensing requirements.